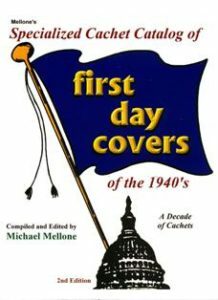 One of the endearing areas of enjoyment in philately over the years has been, and to a large extent still is, the discovery and collecting of first day covers, also known as first day cachets (FDC’s). With their printed designs or inventive inscriptions adding color and sometimes context to the issued stamp, they provide a welcome element of color and artistic design to a first day cover usually issued in the commemoration of a particular thematic, historical or philatelic event. FDC’s can commemorate everything from a first flight, a moon landing, or the Super Bowl. These one-of-a-kind cachets are made by individuals, private companies or in some cases by a government for first day of issue stamp events. Here in the U.S. the first cacheted FDC was produced by prominent philatelist and cachetmaker George Ward Linn in 1923, for the Harding Memorial stamp issue of the same year. 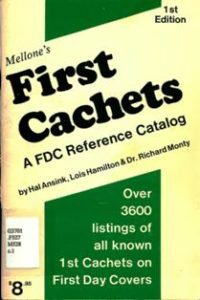 Here at American Philatelic Research Library (APRL) we have a number catalogs that list, identify and value various cacheted FDC’s, but the most respected, authoritative and comprehensive are the Mellone’s catalogs for FDC’s first compiled and produced by noted FDC cachet collector Michael Mellone . 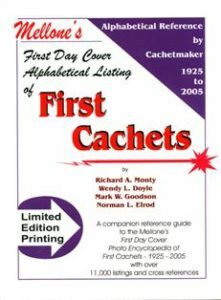 The catalogs provide a wealth of information regarding various details of cacheted FDC’s including cachetmaker, dates of first and last cachets, Scott catalog number, values, and in later editions and variations of the catalogs, pictures of the particular FDC cachets. 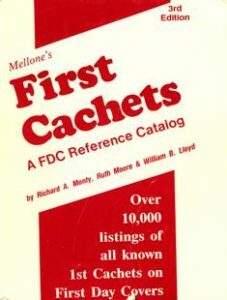 The initial catalogs, titled “Mellone’s First Cachets: A FDC Reference Catalog” appearing in the late 1970s and arranged by cachetmaker, did not include actual images of the FDC’s, however they did included the names as well as known first and last cachets for over 2000 cachetmakers. By the publication of the third edition of the catalog in 1989 the number of cachetmakers included in Mellone’s unique resource grew to 5,000 cachetmakers listed over its now 189 pages. I discovered this posting when trying to find a source to purchase the complete set (most modern volume for each respective era) of Mellone’s. However, I am running into lots of dead ends. One website (4-collectors.com), that seems to be for the publisher, is obviously quite broken and the phone number they give has been disconnected. Another number I found on the web for Mellone has been disconnected. I would try to use other sources (book sellers, online auctions, etc. ), but I don’t know EXACTLY what I am looking for in terms of the MOST RECENT EDITIONS of each respective volume. I want a) fully illustrated if such exists and b) the most recent of each. – What edition/publication date, etc., is the most recent edition of each respective volume for the fully illustrated versions? – Possible sources that actually stock this series?